Trunk or Treat with the Las Vegas Metro Police Department had all of the fun of Halloween on Thursday evening, but none of the fear. There were no streets to cross, with plenty of daylight and adult supervision. Officers quizzed costumed children about how to safely cross in a crosswalk. Less than a mile away from the Cambridge Recreation Center where the event was held, a family of four was hit by a truck while crossing the street earlier this week. A four-year-old boy and his mother were killed. "I don't think they are paying enough attention," said Elizabeth Vilaseco, who was there with her three children. She said she really doesn't like her kids trick-or-treating except at special community events like the trunk or treat. Halloween is one of the most dangerous nights for young pedestrians. 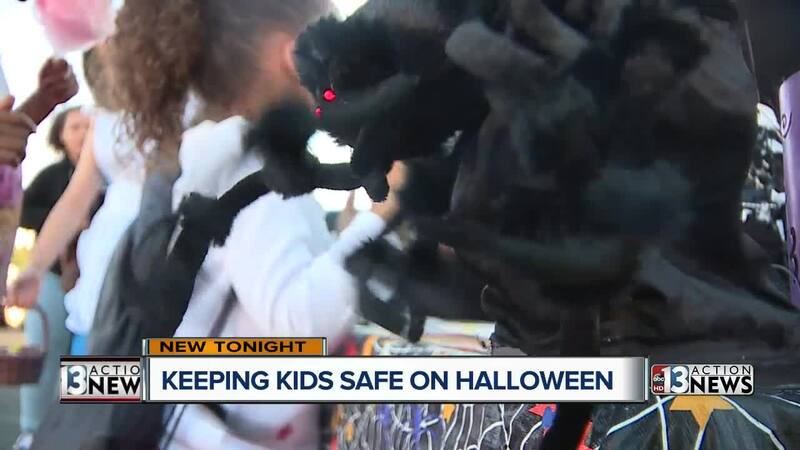 It's why Clark County promotes Inside By 9 which discourages trick or treating after 9 p.m.
Captain Kelly McMahill said her officers will be working hard to make sure that every trick-or-treater makes it home to their families. "We are on the lookout for anyone that is driving recklessly. All of my officers," said McMahill. Capt. McMahill said she could not stress enough how important visibility is when drivers see someone in a crosswalk. "The onus really is on the parents to make sure that the costumes are not completely dark and have some sort of reflective material," said McMahill.